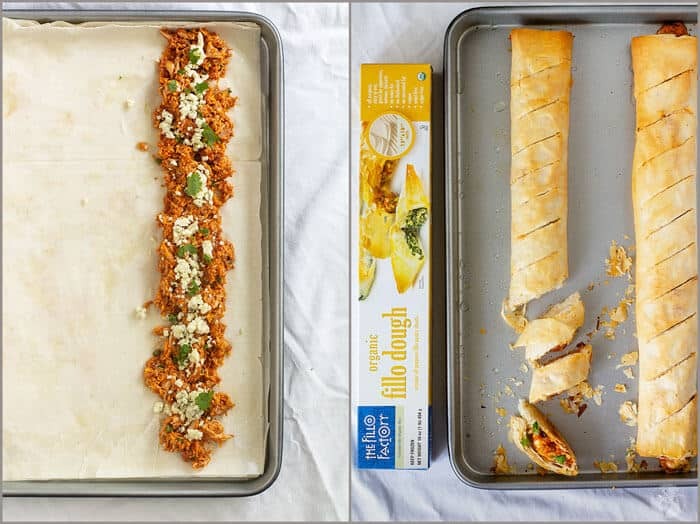 This BBQ Buffalo Chicken Fillo Stromboli recipe is sponsored by The Fillo Factory. Do you have little time but still want to serve a charming appetizer for your next party? We have the perfect recipe for it! 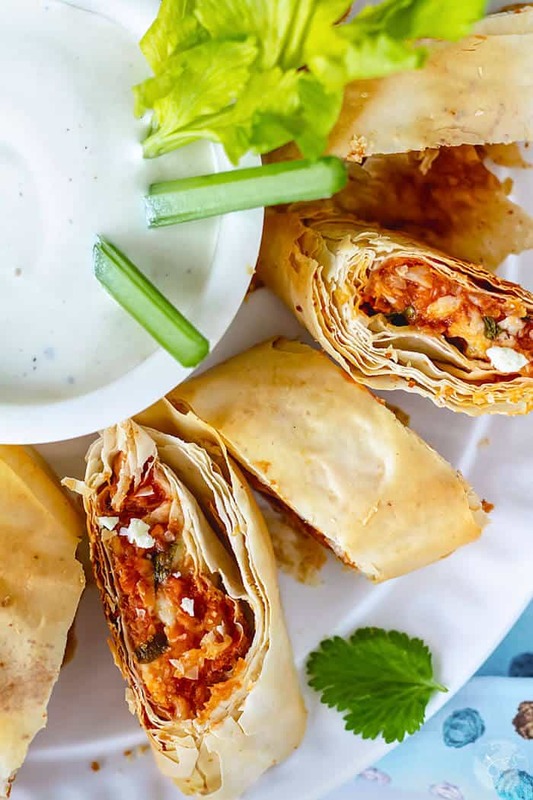 This spicy BBQ buffalo chicken wrapped in flaky fillo sheets is quick and easy to make so you can spend more time with your guests. You will love this mess-free twist on your favorite game day appetizer – chicken wings. You’ll get more for your buck and it’s guaranteed crowd pleaser. Use rotisserie or leftover cooked chicken for the quickest result, mix with BBQ and buffalo sauce and some cheese – voila! It contains less gluten than pizza dough, puff pastry or crescent dough. The Fillo Factory offers a variety of fillo, from different thickness of the sheets to organic and whole wheat. Fillo provides a great texture contrast. Who doesn’t like flaky, crunchy layers? While the Italians love antipasti, the French prefer cold hors-d’oeuvre. Mezze is very popular as an oriental appetizer and in Spain, you can enjoy tapas before the main course. When we gear up for a game day, we’re not only ready for some football we’re also ready for mouth-watering snacks! Doesn’t everyone associate Super Ball with finger food? 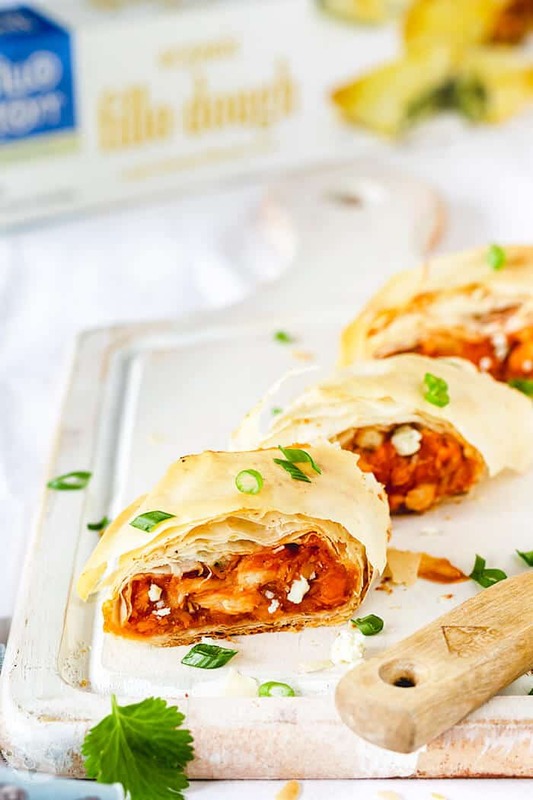 You’ll win big with this BBQ buffalo chicken stromboli! I know you don’t want to spend all day in the kitchen, that’s why this recipe is as simple as it gets. From start to finish in less than 30 minutes! Serve with ranch or blue cheese dressing for dipping! I’ll be making these again for the College Football Playoff party. GO NOTRE DAME!!! I live in the hometown of FIGHTING IRISH! What is your favorite team? What are your favorite easy appetizers to serve? You can add thinly sliced and sautéed red onions to the mix. Oven temperatures vary. Keep your eye on the fillo during the last 5 minutes of baking. Also, fillo thickness varies. Reduce the baking to 12-15 minutes if using extra thin fillo sheets. Use jackfruit instead of chicken for a vegetarian version. In a bowl, stir barbecue and buffalo sauce in with the cooked chicken, stirring to coat. Fold in the cheeses. Melt 4 tablespoons butter and set aside. Prepare a large sheet pan with a layer of nonstick foil or parchment paper. Take your fillo dough and lay out one sheet on a clean surface. Brush it with a little of the melted butter and sprinkle lightly with breadcrumbs (the breadcrumbs will create a bit of separation between each layer of fillo). Put another layer of fillo dough on top, and repeat the butter and breadcrumb process again and again until you have 4 layers. Spoon half of the curry chicken mixture along one edge (lengthwise) of the fillo. Roll it up tightly and set the roll seam side down on the prepared baking sheet. Repeat the process with the rest of the fillo and chicken mixture to make a second roll. Brush each roll with the rest of the melted butter and score both rolls diagonally into 1-inch pieces with a serrated knife. You want to cut them about ¾ of the way down, without cutting all the way through. Bake for 20 minutes, or until the top is golden brown (*check the Free Tip section). Let rest for 10 minutes before slicing the rest of the way through. 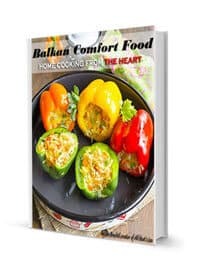 Serve warm or at room temperature and with Ranch or Blue Cheese salad dressing for dipping. 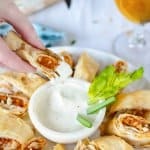 Quick and easy BBQ Buffalo Chicken Fillo Stromboli is a real crowd-pleaser party food that is done in less than 30 minutes! Featured on A Delightsome Life. We have been invited to a cocktail party and asked to bring an appetizer. I’ve pinned yours as I’m sure everyone will love it. 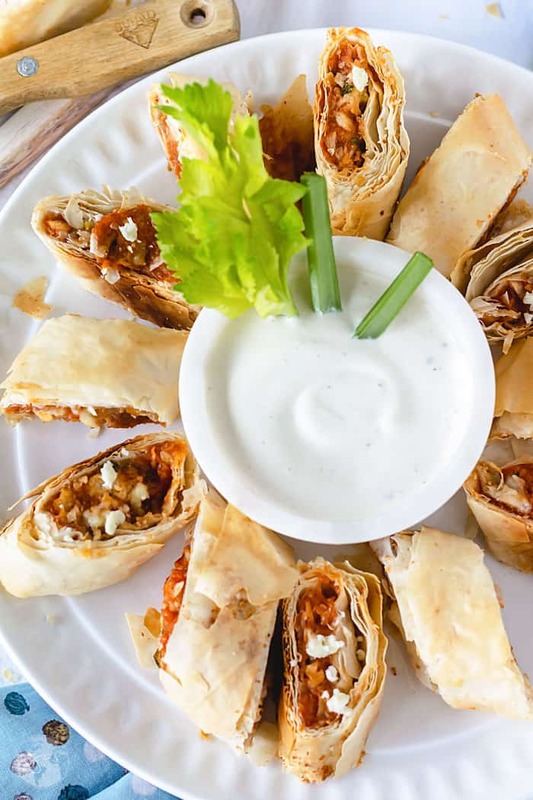 Don’t you love filo dough, it’s so versatile. Wish we had a Fillo Factory over here, although we get some pretty decent filo. 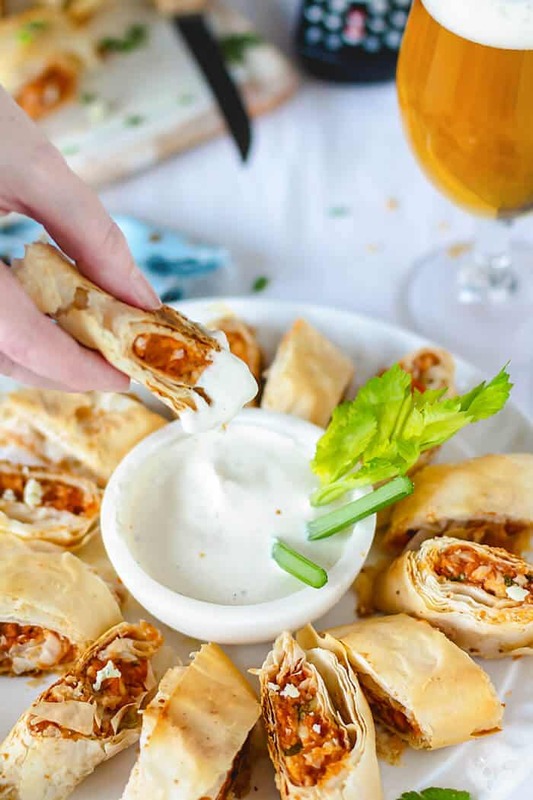 Your BBQ Buffalo Chicken Fillo Stromboli looks great. I love the idea and I’ve also pinned this one. What a lovely way to use the fillo dough. Looks great and thanks for sharing on Fiesta Friday! 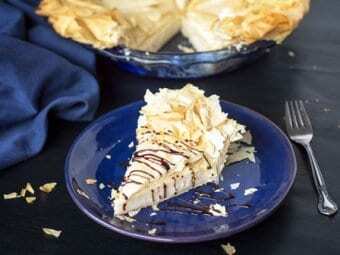 This looks so tasty, I love how crisp filo pastry becomes, crumbs everywhere but absolutely worth it! My husband would go nuts over this. I am pinning it to make over the holidays. 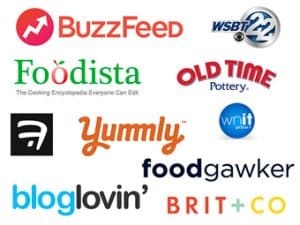 Please stop by Thursday Favorite Things since you are being featured. Thank you so much for the honor, Bev! I know he’ll like it. You’ve got the favorite chicken flavors and the vessel all in one, plus you’ll keep your fingers clean, lol. What’s not to like? Happy holidays!